A meeting devoted to granting the right to permanent use of the Green Corridor pass system, suspension, cancellation and restoration of this right was held at the State Customs Committee (SCC) on January 12. Chairman of the State Customs Committee, heads of main departments, representatives of the Center for Communication and Analysis of Economic Reforms, the World Bank and the U.S. Chamber of Commerce in Azerbaijan attended the meeting. 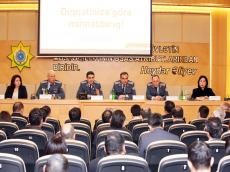 Azerbaijan will apply the green corridor access system for participants in foreign trade operations from February 1, 2019, the first deputy chairman, customs service major-general Ismayil Huseynov said at the meeting. The granting of the right to use the Green Corridor pass system is aimed at creating more favorable conditions for participants of foreign trade operations who comply with the requirements of the law in export-import operations, and also contributes to the acceleration of goods turnover across the customs border, the implementation of more flexible and transparent customs control, the facilitation of international trade, having established relations between officials and businessmen in import-export operations on the basis of modern management principles. The first deputy chairman added that the new system contributes to the formation of the principles of mutual trust between entrepreneurs and customs authorities, which will play an important role in the growth of export potential, foreign trade and economic power of the country. The meeting was organized with the aim to provide information to business entities on the procedure for filling out the application form for obtaining the right to permanent use of this system. On May 21, 2016 the Azerbaijani President Ilham Aliyev signed order on using the Rules of “Green Corridor” and other release systems for conveyance of the goods and means of transport across the customs border. According to the amendments to the Customs Code of Azerbaijan, introduced in line with President Ilham Aliyev’s decree, dated November 30, 2016, in order to simplify the customs registration of goods and vehicles passing through customs border crossing points, green, blue, yellow and red systems can be used on the basis of a short import declaration. “Green corridor” constitutes immediate release of goods without examination based on the customs control and the risk assessment conducted in accordance with the short import declaration which is submitted in electronic form in advance. The main goal is to reduce the interaction of citizens with officials.